Dave Roberts wrote: I guess I have a sense of the importance of property. William and ET, I am certain you would not like a de-regulated zoning model to allow someone to build a coal-fired steam plant without any emission stack scrubbers just downwind from your homes. It would certainly devalue whatever you have. Now to ownership--scripture is clear--"The earth is the Lord's." Since I am a tenant on his property, should I think it's alright to pollute, deface, and destroy what isn't mine to begin with? Yes, I quit digging and researching the topic a long time ago once I became convinced. Everything I've heard has given me no reason to need to do more. I appreciate that you do the digging and though I seldom respond, because I really don't care to argue with everyone here about this one, I'll just keep reading. I’ll note only one person came forward to write against the IPCC conclusions in that issue. It was Christopher Monckton who is not a scientist or a legitimate Lord. The evidence is incontrovertible: Global warming is occurring. If no mitigating actions are taken, significant disruptions in the Earth’s physical and ecological systems, social systems, security and human health are likely to occur. We must reduce emissions of greenhouse gases beginning now. Because the complexity of the climate makes accurate prediction difficult, the APS urges an enhanced effort to understand the effects of human activity on the Earth’s climate, and to provide the technological options for meeting the climate challenge in the near and longer terms. The APS also urges governments, universities, national laboratories and its membership to support policies and actions that will reduce the emission of greenhouse gases. There is a substantial body of peer reviewed scientific research to support the technical aspects of the 2007 APS statement. The purpose of the following commentary is to provide clarification and additional details. The first sentence of the APS statement is broadly supported by observational data, physical principles, and global climate models. Greenhouse gas emissions are changing the Earth's energy balance on a planetary scale in ways that affect the climate over long periods of time (~100 years). Historical records indicate that the Earth’s climate is sensitive to energy changes, both external (the sun’s radiative output, changes in Earth’s orbit, etc.) and internal. Internal to our global system, it is not just the atmosphere, but also the oceans and land that are involved in the complex dynamics that result in global climate. Aerosols and particulates resulting from human and natural sources also play roles that can either offset or reinforce greenhouse gas effects. While there are factors driving the natural variability of climate (e.g., volcanoes, solar variability, oceanic oscillations), no known natural mechanisms have been proposed that explain all of the observed warming in the past century. Warming is observed in land-surface temperatures, sea-surface temperatures, and for the last 30 years, lower-atmosphere temperatures measured by satellite. The second sentence is a definition that should explicitly include water vapor. The third sentence notes various examples of human contributions to greenhouses gases. There are, of course, natural sources as well. It appears the APS is studying it again with a Workshop on 8 Jan 2014. Here is the Transcript. I do notice they have three “skeptics” on the the “Expert Panel” of 6; so this is no railroad job. I’ll have to read some of that but it is 500+ pages. Then ET you may want to consider this, but I doubt you will. Over 100 scientific organizations of national or international standing (includiing 34 national academies of sciences), have concurred with the IPCC, no (0) dissenting organizations and 4 “non-commital” like the American Association of Petroleum Geologists. Searching for those rare “doubts” or “reconsiderations” about GW/CC is grasping at straws to save your political ideology (fomented by anti-gummint, anti-UN dogma and the fossil fuel industry desire to keep the record breaking profits going despite what it is doing to our collective futures). We will see if the APS comes out with a revised statement or not. If they turn “dissenting”, the score would 100+ scientific organizations for the IPCC conclusions, 1 against it. There are a couple of things about these threads that stand out pretty clearly. 1) There is an overwhelming cataract of facts to support the contention that global warming is real, and that it is occurring because of human industrialization. I'd give any student an A on a term paper that provided a fraction of the evidence that Keith has submitted here. 2) Facts just don't really matter if you've bought into the paid propaganda provided by the corporate oligarchy. Dave, I think your argument here is a bit awry. I used to work in municipal planning, zoning to be specific. Zoning regs are based on some semblance of facts that can be traced to specific behaviors (that stinking abbatoir next to my mcmansion will devalue it). GW, it has to be admitted (even by Keith) that there is not a single specific event (a hurricane, tornado, drought, flood) that is directly traced to it; therefore, there is no neighbor from whom one can assess damages. When FL is under water, then you will have a traceable event. The earth has warmed and cooled many times without our help. There are plenty of scientists who do not assess blame as does the GW true believers, and more still who are not willing to swallow the alchemy of the various models, especially those that predict results decades down the road. I'm with Krauthammer who states that it is not good to pump all this carbon in the atmosphere (and that without his swallowing the GW true believer manifesto) but it is silly to punish the US and every citizen for no good reason other than to satisfy the corporate greed and special interests that Sandy is perfectly comfortable with, the enviro-educational-gummit complex. This latest report is about politics, manifestly so. It is stated that the reason for all the chicken little pronouncements (Cranberry growers in Maine will be devastated! Act now!) is to formulate gummit action. William, I was just tweaking you a bit about believing that free markets will take care of things. Actually, even zoning impedes the free market. Also, the markets are a human creation just like government is a human creation--both equally imperfect among sinful people. William Thornton wrote: Dave, I think your argument here is a bit awry. I used to work in municipal planning, zoning to be specific. Zoning regs are based on some semblance of facts that can be traced to specific behaviors (that stinking abbatoir next to my mcmansion will devalue it). GW, it has to be admitted (even by Keith) that there is not a single specific event (a hurricane, tornado, drought, flood) that is directly traced to it; therefore, there is no neighbor from whom one can assess damages. When FL is under water, then you will have a traceable event. Seems like the water is already rising, and causing concern. Amazing, isn't it, when multi-billion dollar property and private corporate interests are at stake, how fast the opinion changes from "there is no such thing as global warming" to "how can we convince the local government to spend billions to protect our valuable property and investments." This report from the World Resources Institute has 50+ references showing that 2012 was the worst year in recorded history. 2013 report not yet out but an interim discussion up to July 2013 is available here). Check it out. WRI was founded in 1982. Ice melt in part of Antarctica 'appears unstoppable,' NASA says. Although the time frame is still centuries away. But the cause is most likely of our industrialization timeframe (1900-now) including both global warming and ozone depletion which have caused wind shifts in the area. Gee, Dave, REALLY? You go from a debate as to whether man, in just the last 100 years on this planet, is the cause of warming that has gone off and on for supposedly hundreds of millions or even billions of years, to turning William's and my skepticism into a question about, essentially, whether we want to breathe dirty air and drink dirty water? How many eagles and other flying wildlife are you willing to kill in your pursuit of wind and solar power, or are you unaware that some producers of such power have sought exceptions from the U.S. government in order to be able to kill golden and bald eagles? Solar panels are frying birds, also. Apparently you, Keith, Timothy and others don't care about the creatures God created, for you seek to vastly increase the number of wind turbines and solar panels, which can only lead to increased deaths of such wildlife. KeithE wrote: Then ET you may want to consider this, but I doubt you will. Over 100 scientific organizations of national or international standing (includiing 34 national academies of sciences), have concurred with the IPCC, no (0) dissenting organizations and 4 “non-commital” like the American Association of Petroleum Geologists. So all ya gotta do, Keith, is convince me that a group of folks dependent on the "corrupting influence of (government) money", who have a long, long history of failed predictions regarding the future, should be believed in their latest prediction for the future. As I said, if you've whiffed 10, 20 or 30 times at the plate before, don't expect me to believe you'll crank one out of the park the next time up. Recent findings show that the occurrence of extreme weather and climate events are on the rise, and the historic damages caused by Hurricane Sandy highlight the immense vulnerability of the United States to such extreme events in a warming world. 1) largest hurricane ever observed in the Atlantic -- so? for how many years have hurricanes been observed and measured in size? There is no context. It is sensationalist in nature. 2) damage estimates - whoop-di-do. Another irrelevant figure. It hit a highly populated, highly priced section of the country. I would imagine that damages done in 2012 are far more pricey than damages done 30, 50 or 100 years ago. In absolute dollars, one should expect nothing else. 3) One storm in 108 years is tagged as the "most destructive storm" NYC's subway system history. Once again...so what? How many other storms anywhere near a cat 3 hurricane over the last 108 years are involved in this comparison? 4) The last three bits about housing, cancelled flights and the stock exchange are, again, so what issues? "DATA" for the non-critical thinker. One cat 3 hurricane - two notches below the most extreme - manages to get lucky and hit the jackpot by nailing NYC. Another useless bit of information with no context upon which to build a supposedly scientific argument. Nice trivia for a game show, however. If it hadn't reached landfall, would it even be used as evidence of an increase in extreme weather? A little yellow journalism for "climate disruption" (aka "The Climate Hysteria Formerly Known as Climate Change"). I guess they'd be using Katrina, another Cat 3 hurricane that managed to hit the jackpot by nailing a city built BELOW sea level. Real genius in that decision. But, hey, we'll rebuild it. After all, we're humans, and we're stupid. Per this video from the Weather channel, there were 13 storms in 2013, only 2 hurricanes and the thirty year average is 12 storms. We didn't have a cat 2 or higher hurricane for the first time since 1968. Katrina was a cat 3 hurricane. Sandy was a cat 3 hurricane. Do two cat 3 hurricanes in 7 years that happened to make landfall at densely populated areas constitute a "rise in extreme weather events"? A rise from what? For 2013 - the year following Keith's referenced report - we were a single, solitary storm outside of the 30 year average. One storm, mind you, in a season of anything but "extreme weather". So the dude in the video at the 1 minute mark tosses out that the reason for the LOW number of storms may be something signaling "climate change". So one one hand climate change will cause more extreme weather. On another it's an excuse for the fewer number of storms in 2013 and for no cat 2 or greater storms in 46 years. So, depending on the situation, climate change can be used to support both more extreme weather and less extreme weather. It does it all!!! According to this Wikipedia entry (with DATA! and a CHART! ), the 1880s - at the dawn of the industrialization of America - had more "extreme weather events"/hurricanes than any other decade that affected the United States. And unless things get kicking here soon, we're on track to come it right at the average again for this decade, plus or minus a storm or two. Only 3 storms affecting the U.S. in the first 4 years of the 2010s. Then there's the wildfires. According to Smokey the Bear and his radio and TV ads, he tells me up to 90% of wildfire is due to humans setting them either intentionally or through neglect, but that's another matter, along with the eco-nuts keeping the Forest Service from clearing out underbrush (kindling and fuel) from forrested lands. I may have to turn in an "extreme weather event" for the folks to put on their WFI timeline that happened to me last year. As I recorded on my Facebook page, it wasn't until the first week of August that really hot and humid weather set in around Memphis. Hot and muggy summer temps came VERY late to Memphis last year. On August 8th, I noted that it was 83 degrees at 10 o'clock at night and how happy I was we had an unusually mild late June and July. The next week, on the 14th and 15th, I noted that for the first time in my almost 50 years, I spent two days plus driving around Memphis WITHOUT the A/C on...sunroof open, windows down DURING THE DAY. If that was the result of global warming resulting in "extreme weather", then BRING IT ON!!! Last edited by ET on Fri May 16, 2014 3:17 pm, edited 1 time in total. I remember Memphis in 1980 with 15 straight days of 100+ temps and a high of 108. I was working in attics then (albeit in very early morning hours) putting in insulation. I would have been a true believer in GW back then but gummit had not officially declared it and Al Gore hadn't made a movie. Then there's the wildfires. According to Smokey the Bear and his radio and TV ads, he tells me up to 90% of wildfire is due to humans setting them either intentionally or through neglect, but that's another matter, along with the eco-nuts keeping the Forest Service from clearing out underbrush (kindling and fuel) from forested lands. Real climate scientists say hurricane frequency is not increasing due to global warming but the instensity of those hurricanes increase the total energy in those hurricanes due to the sea surface temperature in Hurricane season. Trends in human-influenced environmental changes are now evident in hurricane regions. These changes are expected to affect hurricane intensity and rainfall, but the effect on hurricane numbers remains unclear. The key scientific question is not whether there is a trend in hurricane numbers and tracks, but rather how hurricanes are changing. The intensity, frequency, and duration of North Atlantic hurricanes, as well as the frequency of the strongest (Category 4 and 5) hurricanes, have all increased since the early 1980s. The relative contributions of human and natural causes to these increases are still uncertain. Hurricane-associated storm intensity and rainfall rates are projected to increase as the climate continues to warm. Hurricane development, however, is influenced by more than just sea surface temperature. How hurricanes develop also depends on how the local atmosphere responds to changes in local sea surface temperatures, and this atmospheric re- sponse depends critically on the cause of the change.83 For example, the atmosphere responds differently when local sea surface temperatures increase due to a local decrease of par- ticulate pollution that allows more sunlight through to warm the ocean, versus when sea surface temperatures increase more uniformly around the world due to increased amounts of human-caused heat-trapping gases.80,84 So the link between hurricanes and ocean temperatures is complex. Improving our understanding of the relationships between warming tropical oceans and tropical cyclones is another active area of research. Changes in the average length and positions of Atlantic storm tracks are also associated with regional climate variability.85 The locations and frequency of storms striking land have been argued to vary in opposing ways than basin-wide frequency. For example, fewer storms have been observed to strike land during warmer years even though overall activity is higher thanaverage,86 which may help to explain the lack of any clear trend in landfall frequency along the U.S. eastern and Gulf coasts.87,88 Climate models also project changes in hurricane tracks and where they strike land.89 The specific characteristics of the changes are being actively studied. Other measures of Atlantic storm activity are projected to change as well.87,90,91 By late this century, models, on aver- age, project a slight decrease in the annual number of tropical cyclones, but an increase in the number of the strongest (Category 4 and 5) hurricanes. These projected changes are based on an av- erage of projections from a number of individ- ual models, and they represent the most likely outcome. There is some uncertainty in this as the individual models do not always agree on the amount of projected change, and some models may project an increase where others project a decrease. The models are in better agreement when projecting changes in hurri- cane precipitation – almost all existing studies project greater rainfall rates in hurricanes in a warmer climate, with projected increases of about 20% averaged near the center of hur- ricanes. KeithE wrote: I do not find the “tidbits” of evidence ET pointed out. Perhaps they are there somewhere (discussion of Sandy?). ET could you point to your words and maybe give the whole context of what was said? They appear to be examples of the destructiveness of a hurricane and Sandy was only a Cat 3. KeithE wrote: This report from the World Resources Institute has 50+ references showing that 2012 was the worst year in recorded history. OK ET you found the “tidbits” which were meant to show the destructiveness of hurricanes. They were in the introductory Fact Sheet on Extreme Weather (on page 2) not page 2 of the NCA “report in my first link”. And you make light of this destructiveness. For instance you did not even mention the $79B in damages. Instead made a very callous “whoop-di-do” expression about damages that were felt very strongly by millions of people. This introductory Fact Sheet on Extreme Weather was highlighting the very real climatic destructiveness that occurred in 2012. 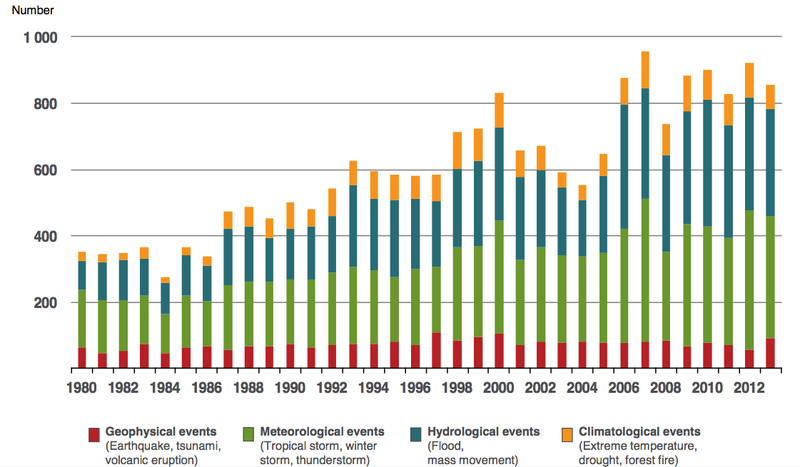 It was not making the case for AGW causing increases in climatic disasters. For that you will have read the rest of the report which means you have to get over your callousness, your anti-government/anti-collective action ideology, and read the facts with an open mind not eager to make light of the ever expanding degradation to the earth’s habitat. If any of you had watched the "This Old House" marathon today on public tv that showed the devastation of the homes on the Jersey shore from hurricane Sandy you would see how a "Whoop di doo" answer is a real slap in the face to thousands of heartbroken families. Say "aw whoop di doo" to the victims of the Oso slide just a short drive from our house. Somebody has a problem with an "I have mine, nuts to you" attitude me thinks. See this report; The plateau above the hillside that gave way has been logged for almost a century, and the hillside has a history of landslides dating back more than 60 years. For more than 25 years, as the slope became more unstable, scientists challenged the timber cutting and warned of possible calamity. Yet the state continued to allow logging on the plateau. A "clear-cut" is an area of land in which all the trees have been cut down. One suspected trigger of the Oso landslide is a clear-cut, undertaken 9 years ago, that apparently encroached into a restricted area and is only now being investigated. The landslide, which occurred near the banks of the Stillaguamish River, was not only predictable; it was also predicted. New York Times reporter Timothy Egan recounts touring the headwaters of the Stillaguamish 25 years ago with Pat Stevenson, a biologist with the local Stillaguamish tribe: "Stevenson pointed uphill, to bare, saturated earth that was melting, like candle wax, into the main mudslide. Not long ago, this had been a thick forest of old growth timber. But after it was excessively logged, every standing tree removed, there was nothing to hold the land in place during heavy rains. A federal survey determined that nearly 50 percent of the entire basin above Deer Creek had been logged over a 30-year period. It didn't take a degree in forestry to see how one event led to the other." Forest root systems hold the soil in place, and old-growth forests absorb about ten times as much water as clear-cut land. For several years in recent history the area has been over built with Homes in the $500,000 and up range. Therefor it is not reasonable to compare recent damage with the distant past. Ed P., Saying "whoopi-di-do" to any disaster victim is over the top. The monetary damage ($79B) due to Sandy was from the National Climate Assessment (NCA) Fact Sheet 2012: A YEAR OF RECORD-BREAKING EXTREME WEATHER & CLIMATE not from me. BTW, it was only for New Jersey and New York state. ET had not mentioned the damage amount in his "whoopi-di-do" post (take that pesky $79B out) which preceded any dollar amounts mentioned by me so he was not "discounting" my figures. He was "whoopi-di-doing" the 2012 NCA Fact Sheet. With better Slope, Logging, Shoreline Management funding to enforce good practices (which GOPites generally oppose like they do most EPA/state environmental enforcement) perhaps homes can be made stronger to withstand the stronger storms/mudslides or not be allowed. This is very typical of Republicans of late - severely limit government money to execute programs and then cry "bad government" when performance is subpar. The endpoint is a chaos of individual dog-eat-dog. Ed - did you forget to include the Interactive Map? Bush 43 ambassador to Canada, David Wilkins is endorsing Lindsey Graham--fox news darling on benghazi--in a pro Keystone ad in Upstate S.C.
Another controversial topic is the Keystone pipeline, which would bring oil from the tar sands regions of Canada into the United States. If the Keystone pipeline permit is approved by the Obama Administration, what are the impacts of that decision? From start to finish, fuels made from tar sands have 40 percent more carbon dioxide emissions than fuels made from conventional crude oils. Even if you could reduce the production emissions, tar sands make the same fossil gasoline and diesel fuel that are sources of the global warming problem. So it’s not really about the Keystone pipeline: it is about the path we are on. We still need to move towards a transportation system that uses renewable energy sources. If we are going to invest billions and billions of dollars in new sources of energy, they should be fuels and energy systems that are cleaner than the fuels we are burning today, not dirtier. Mrs Haruo wrote: If any of you had watched the "This Old House" marathon today on public tv that showed the devastation of the homes on the Jersey shore from hurricane Sandy you would see how a "Whoop di doo" answer is a real slap in the face to thousands of heartbroken families. Say "aw whoop di doo" to the victims of the Oso slide just a short drive from our house. Somebody has a problem with an "I have mine, nuts to you" attitude me thinks. Settle down. Settle down. Gee whiz....I realize you folks associate with the crowd that truly believes Republicans want to drink dirty water, breathe poisoned air, starve women and children and push old ladies off cliffs in wheelchairs or make them subsist on dog food, but...yikes. I was not making light of the actual, physical destruction and human toll. I was taking issue with the use of a bunch of figures without any context used to promote hysteria about coming climate doomsday. Keith, Sandy, Timothy, and a host of others will often pontificate and seemingly obsess over the amount of money in politics, in lobbying...in anything they don't like. What about the "global warming industry"? Interesting article from Forbes about the millions and billions of dollars being redistributed from taxpayers to scientists and whomever else wants to share in the wealth in the name of saving the planet. $32 billion in a 20 year period on climate studies alone. $79 billion more for technology research, tax breaks and foreign aid. The "stimulus bill" had $26 billion for "climate change programs and related activities". Probably stimulated the checkbooks of a good many scientists. A U.S. Energy Information Administration economic forecasting model indicates that a proposed 70% cut in CO2 emissions will cause gasoline prices to rise 77% over baseline projections, kill more than 3 million jobs, and reduce average household income by more than $4,000 each year. So following the logic of Keith, Sandy, Timothy & Co, if so much money corrupts CEOs, if so much money corrupts the political process, what does all this money do for "science"? If there another area of "science" where those that challenge whatever the conventional wisdom is at the time are labelled "deniers"? Barack Obama, understanding the histrionics required in climate change debates, promises that U.S. emissions in 2050 will be 83 percent below 2005 levels. If so, 2050 emissions will equal those in 1910, when there were 92 million Americans. But there will be 420 million in 2050, so Obama’s promise means that per capita emissions then will be about what they were in 1875. That. Will. Not. Happen. Some climate scientists compound their delusions of intellectual adequacy with messiah complexes. They seem to suppose themselves a small clerisy entrusted with the most urgent truth ever discovered. On it, and hence on them, the planet’s fate depends. So some of them consider it virtuous to embroider facts, exaggerate certitudes, suppress inconvenient data, and manipulate the peer review process to suppress scholarly dissent and, above all, to declare that the debate is over. Consider the sociology of science, the push and pull of interests, incentives, appetites and passions. Governments' attempts to manipulate Earth’s temperature now comprise one of the world’s largest industries. Tens of billions of dollars are being dispensed, as by the U.S. Energy Department, which has suddenly become, in effect, a huge venture capital operation, speculating in green technologies. Political, commercial, academic and journalistic prestige and advancement can be contingent on not disrupting the (postulated) consensus that is propelling the gigantic and fabulously lucrative industry of combating global warming. Last edited by ET on Thu May 22, 2014 9:59 pm, edited 1 time in total. So, now are you convinced that global warming/climate change costs plenty to clean up after or that there has been an increase in human suffering since 1980? Didn’t think so. Read the report! The so-called “hysteria” is a realistic concern with data to back it up. Those using inflated rhetoric with exaggerated words like “hysteria” and "pushing old ladies off cliffs in wheelchairs” and “whoop-di-do” are coming from the skeptics/denialist side of the issue not the scientist’s. ET wrote: Keith, Sandy, Timothy, and a host of others will often pontificate and seemingly obsess over the amount of money in politics, in lobbying...in anything they don't like. What about the "global warming industry"? Interesting article from Forbes about the billions and trillions of dollars being redistributed from taxpayers to scientists and whomever else wants to share in the wealth in the name of saving the planet. $32B over 20 years = $1.6B/year in research. Not much when one considers the importance. Profits (generally ~5% or $80M/year) go to the university not the scientists who are probably making far less than they could get in industry. As a reviewer of many a proposal, believe me I know most university studies are a good deal compared to private industry studies. 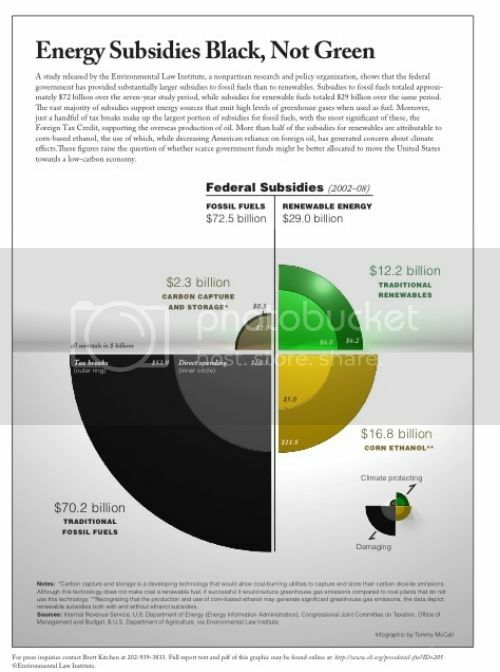 In terms of subsidies/tax breaks, fossil fuel industry got about $72.5B over the 9 year period 2002-2008 ($8.1B/year) while alternative energy is about $29B over that same period ($3.2B/year). Subsidies/tax breaks are usually for startup technologies of future value not decades old industries. ET: about the billions and trillions of dollars being redistributed from taxpayers to scientists and whomever else wants to share in the wealth in the name of saving the planet. I find your “gigantic and fabulously lucrative industry combating global warming” completely overstated especially in light of Exxon-Mobil’s $40B+/year profit for several years. And that’s just what they reported. Compared to the global warming research profits of ~$80M/year, that is 500 times as large just for Exxon Mobil. But all these figures need to be brought up to date. Should have been millions and billions....that's the dollars being spent. The trillions comes into play when regulatory cost estimates are considered. But let's keep these real-world figures out front since they are the most direct way we will pay for all this...uhhh...doo-doo. With no other factors considered, that means gas would go from $3.50 today to $6.10 or so. $4000 in reduced income. Doesn't mention the increase in electricity prices certain to come with more regulatory bovine fertilizer. I have tried to find the US EIA findings you quoted above in their 2014, 2013, 2012, 2011, 2010 Annual Energy Outlook Reports and other assorted US EIA Reports but came up empty. Do you have the source? - it was not referenced in the Forbes 2011 article. I most often find missing context, very old cherry-picked data, to outright fabrication from sarcastic articles like this one ET found from Forbes entitled The Alarming Cost of Climate Change Hysteria. And that sarcasm gets amplified into "regulatory bovine fertilizer" by some of their readers. The Forbes article did link the GAO report but I see that they claimed numbers that were not there like the $106.7B they said was spent on climate in some unreferenced period (sloppy); but were accurate about the growth in climate spending from $4.6B in 2003 to $8.8B in 2010 and $26.1B in the stimulus or American Recovery Act (ACA) meant to be spent over 4 years (2011 -2014). They greatly amplified the tone of the 2010 GAO report and it's recommendation for more coordination among the various agencies dealing with climate studies/alternative energy (that is standard, benign fair from the GAO - you should see what they say about the Missile Defense Agency - some deservedly so I'm afraid to say). Aug 2013 Federal Climate Change Expenditures Report to Congress. The 2014 budget is $21.4B (down from $22.6B in 2013, compared to $8.8B in 2010, $4.6B in 2003). That growth in spending is justified imo and funded as part of the stimulus (ARA). $7.9B of the 2014 budget of $21.6B (37%) is for Clean Energy subsidies for R&D. That is far less than the subsidies given to Big Oil/Gas/Coal which was $41B/year in 2011 (was as high as $100B/year in 2007 Bush’s era) - have not found it for 2012-2014 (I trust it is down somewhat). And Big Oil/Gas/Coal are plenty profitable w/o subsidies. Besides subsidies should go to new needed technologies not old established, already profitable ones.